Back in December 2007, Robb Report`s senior correspondent Jack Smith, reported on a new crop over the top suites crowning the Manhattan`s premier hotels. It was the Ty Warner Penthouse at the Four Seasons Hotel in New York, a nine-bedroom, 4,300 sq.f. extravagance that was described as the “most expensive” suite on the planet. Now, Warner i at it again , nine years later. This time Mr. Warner is bringing his flair for the dramatic to the beaches of Los Cabos. 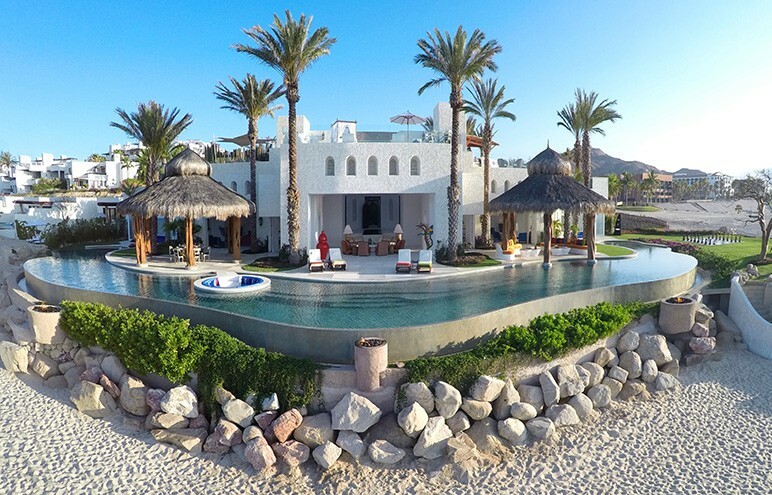 He is proud owner of one of the world’s finest beach resorts, Las Ventanas Al Paraiso, located on the Los Cabos corridor. The Rosewood managed resort is going to unveil this July, it`s new La Mansion del Señor Warner, a $35,000/ night luxury villa that promises to do for the resort rooms what the Penthouse at the Four Seasons did for the suites..
As Mr. Warner earlier said: “ I have the best Penthouse in the World, now i want to have the best hotel villa on the world” – and he did it!!! This unmatched property, which spans 22,500 sq.f. 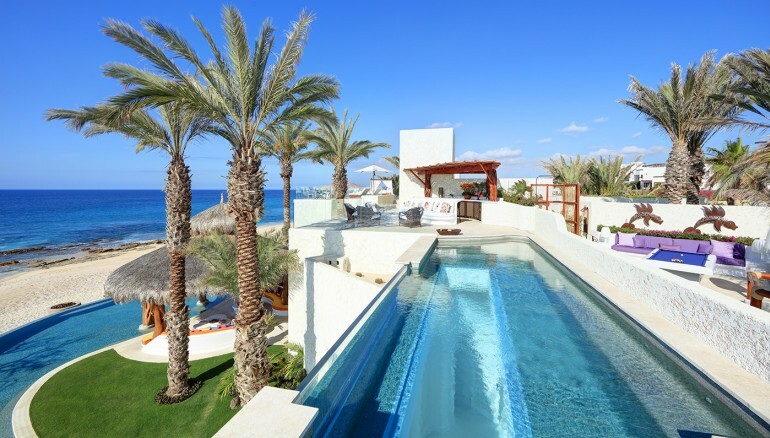 from it´s vertical garden courtyard entrance to it`s 328 foot long private overlooking the sea of Cortez pool. The team- including Vidal, the local architect Jorge Torres and the interior designer from New York- Robert Couturier, executed down to the very last square inch the vision of Mr. Warner. 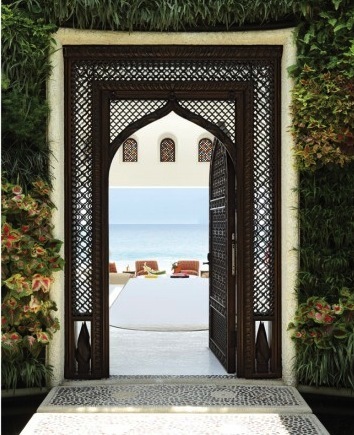 Once you enter through a carved wooden door designed by Torres, guests of the villa stroll past a reflecting pool and below a retractable sunroof before descending to the living room. The room’s Wall of sliding glass doors, magnified the motif of the name of “Las Ventanas al Paraiso”, which translates “The Windows to Paradise”. White concrete framses the view, rising to a 20 foot high domed ceiling that encapsulates the unconventional style of the villa. The upholstered in silks from India sofás and chairs, were designed by Couturier. A wooden Dragon by the Oaxacan artista Claudio Ojeda Morales can be seen as part of the decoration. 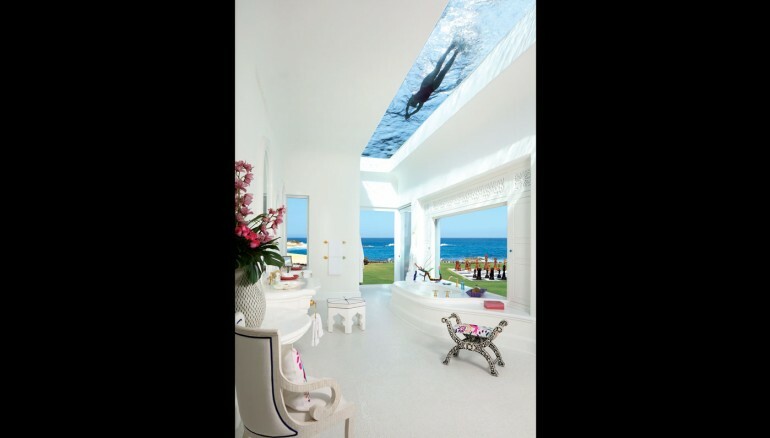 Holding it all up is what might be the villa masterwork: $7.5 M hand–laid white marble tiles floors. 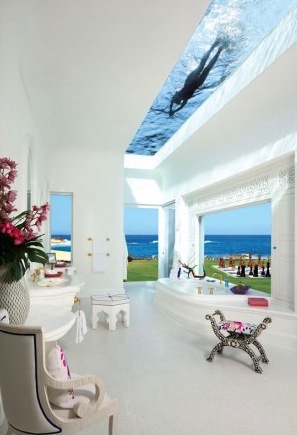 A lap pool above the master bathroom, is an idea that Warner came up with. After the bathroom was built, they had to demolish the whole room and completely rebuild it, to the ground. Now the pool became part of a sprawling rooftop that includes a plunge pool, indian silk laden bed, a bar, outdoor pool table, SPA area, and a putting Green. Just outside the bathroom, on the ground floor, a lawn stretches past a chess set to a hot tub has been carved from a rocky ridge above the beach. 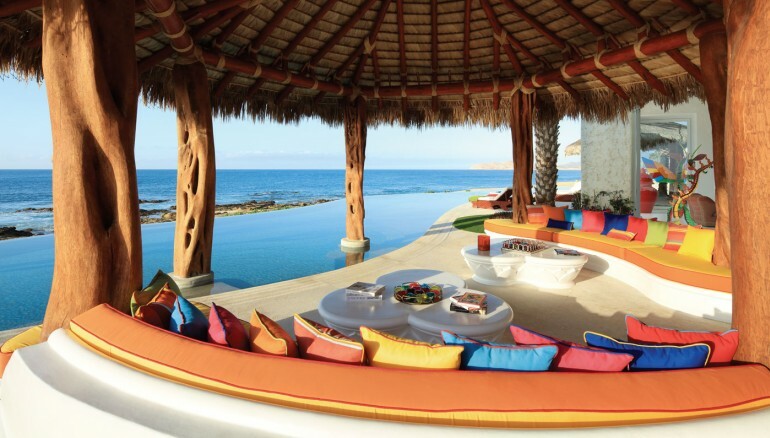 The patio’s pair of 16.5-foot-long sofas offer an ideal setting for afternoon chips, guacamole, and coctails. Should guests retire to the area after dinner, they might be handed a metal control box that, with the push of a button, launches a fitting finale to a few days in paradise: a private fireworks show on La Mansión’s beach.